Citron leaves are known for its medicinal values and effective for treating nausea, vomiting, and heartburns. Veppilai katti is a traditional tambrahm pickle. This is a powder based pickle, yes, you read it right, pickle in powder form, made by pounding the tangy flavoured citron leaves and some spices. Actually this has NO NEEM LEAVES, but is named so.This pickle will be in powder form and can be shaped to small balls as well. Both Narthai ilai podi and veppilaikatti are same. If in powdered form we say it as Narthai elai podi and if shaped to balls we say it as veppilai katti. It has a longer shelf life. Some stores also sell veppilaikatti, but they add tamarind and more chillies giving it a brownish red colour. Personally, I dislike the tamarind taste in this pickle. So, I make this at home as I prefer the aroma of the leaves to dominate and the greenish colour. Nartha ilai podi / Veppilaikatti is tangy flavoured, spicy pickle and makes an excellent accompaniment to curd rice. Pluck tender citron leaves and lemon leaves, wash well, pat it dry, remove the veins as shown in picture. Keep ready. Heat a kadai and dry roast chillies for a minute. Dry grind hing, chillies and ajwain to a coarse powder in a mixie. Keep aside. Pulse the leaves, alongwith required salt coarsely. Combine all ingredients and pulse it to a coarse powder until everything is mixed well. Transfer to a bowl, add lime juice and make small balls. After drying, the colour changes, don't worry it is edible. Narthai ilai podi / Veppilaikatti is ready. 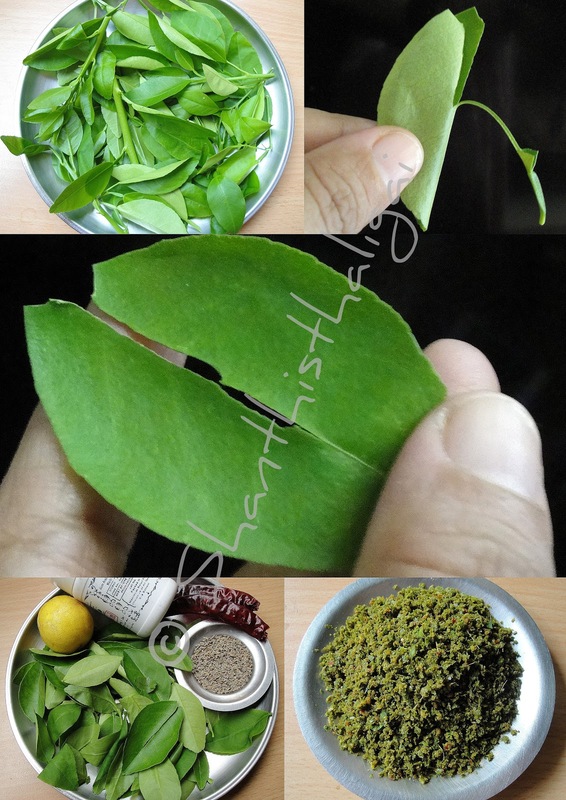 Lemon leaves can be substituted for citron leaves. Adjust chillies and lime juice to suit your tastebuds. Done only with narthai leaves. Curry leaves can be added. Tamarind and more chillies are added which gives a brownish red colour to the balls. Some add green chillies. Some add pepper and cumin.